Log in to get emails when Lisa Loving has something new. 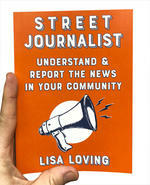 Lisa Loving is an award-winning journalist and media activist. As a staff member and volunteer at KBOO Community Radio in Portland, Oregon, she has trained hundreds of everyday people in the tools of independent journalism. She has reported for WIRED and the Oregonian; she was the stringer on the ground for the The New York Times when Keiko the Killer Whale was flown into the Oregon Coast Aquarium from Mexico. But Lisa has spent almost her entire journalism career in community media, including a decade as news editor of The Skanner, an African American family-owned newspaper serving Portland and Seattle. Lisa was one of the University of Oregon Agora Center’s “Front 50” regional innovators in media, and she is convinced that everyday people are -- and have always been -- the real thought leaders in our media landscape.